Mr. Media is recorded live before a studio audience of famous vikings including Leif Ericksen, Erik the Red and Brett Favre… in the new new media capital of the world… St. Petersburg, Florida! Order ‘Hagar the Horrible: The Epic Chronicles: The Dailies 1976-1977’ by clicing on the book cover above! Hagar the Horrible is getting his due. Finally. 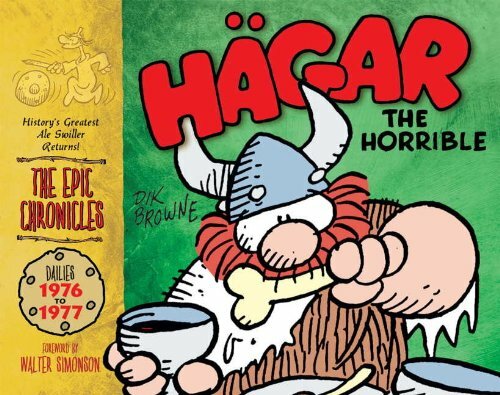 The adventures of one of the most unique, consistently funny comic strip characters – a dirty, drunken viking, of all things – is finally being collected in book form with publication of Hagar the Horrible: The Epic Chronicles. The strip, created in 1973 by Dik Browne – co-creator of with Mort Walker of “Hi and Lois” – holds a special place in my heart. When it debuted, I was a 13-year-old with his own subscription to the Newark Star-Ledger. My parents paid for home delivery of the New Brunswick Home News, but it was an afternoon paper with horrible comics and even worse sports coverage. So I took my own money each week – earned cutting lawns in the summer, shoveling snow in the winter – and paid for a morning Star-Ledger subscription. I’m proud to say I have read Hagar from the very beginning. It was a big kick then, a few years ago when an odd business magazine assignment landed me in the Sarasota, Florida home and studio of cartoonist Chris Browne, son of Dik and his successor on Hagar. Chris was a wonderful host and I think it safe to say we hit it off famously. Friendship aside, it’s taken me years to convince Chris to step up to the microphones for a Mr. Media® interview, but the timing couldn’t be better as we celebrate his father Dik’s original work and Chris’ continuing efforts on Hagar the Horrible.